When your child does something that you see as wrong, what is your reaction to it? Do you get angry, annoyed or exasperated and do you start to yell, question, blame, shame, ridicule or find faults with your child? The Prophet, peace and blessings be upon him, was known to be kind and gentle, especially with children. He never did any of this. 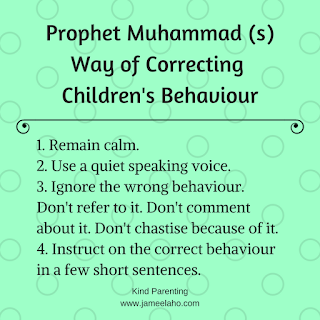 He was patient with children and the way he responded to them and corrected their behaviour is the example for us to follow. For many of us, when we see an incorrect behaviour, our automatic reaction is to become angry. We see a behaviour that's not correct and instantly a record starts to play in our head of "What is he doing? I've told him/her before not to do that! Why is he doing that? Who does he think he is? How can he do this to me? Where does he get off doing what he does? When will he ever learn?" These are questions that make us angrier by the second. To stop this escalation, we need to seek refuge with Allah from shaytan and take deep breathes to calm us before we act. The Prophet, peace and blessings be upon him, never acted out of anger or rashness. Not to children and not even to adults. Think back to a time when you were toilet raining your child and he accidentally urinated on your floor. What was your reaction? Did you get upset? The chances are that most of us would have been upset at the mess and having to clean up. I've seen parents who would get angry and start to blame and shame their child. The key is to control your emotions and remain calm. Ignore it does not mean we don't deal with it. It means that we don't comment on it or refer to it at all. Most of us will make a point of highlighting the behaviour. We either criticise it or ridicule it and we blame or reprimand the person for doing it. Like the hadith above in which the man urinated in the mosque, the Prophet, peace and blessings be upon him, didn't rebuke nor did he revile when someone did something wrong. The Prophet, peace and blessings be upon him, never belaboured the point and never lectured on it. He gave instructions in as few short words as possible. In this hadeeth, you can see that the Prophet, peace and blessings be upon him didn't rebuke the child for doing the wrong thing but he instead told the child the correct manner in which to eat in three short instructions: 1. Mention the name of Allah, 2. Eat with your right hand, and 3. Eat what is in front of you. This is easy for a child to remember. He, peace and blessings be upon him, didn't elaborate on it by going into a lecture. It was short and to the point. Great article. Really awesome reminders. I’ve benefitted a lot from it. Jazaakilaahu kheyran! Wa iyaki. Alhamdulillah and thank you. Glad to be of service! Thank you.. Great article. I've been doing it wrong the whole time..